This article is the third installment in a four part series on applying the Bondarchuk system of sports preparation. For those who have read the previous two articles (Exercise Classification and Transfer of Training), I apologize for the delay in putting this article out. In the past I have not been as thorough in researching various details in reports on Soviet Sport systems, especially in terms of application, as I should have. This is just part of the learning curve in terms of talking about the way that the USSR did things in sport, the more you know, the more questions there are to ask. My point here is that I wanted to be very thorough in my understanding of this article’s topic so that took some time. For those of you who have not read the previous articles this one can be read first, but you can find the other two (here; hyperlink). If you have questions on this article or the series, please feel free to comment below or email me at [email protected]. If you have a question I do not know the answer to, I will ask Dr. Bondarchuk himself and put his answer out on here. So if you have questions, fire away. There are also other resources and experts more qualified than myself to discuss various topics related to Dr. Bondarchuk’s work. Names such as Dr. Michael Yessis, Yosef Johnson, Dr. Bryan Mann, Martin Bingisser, and others. These experts can all be consulted if questions need to be explored in more detail. Those of you in research or who have a research background, please go easy here. I didn’t ask Dr. B about the intricate details of his study methods. I asked for a rundown of what happened. If you want a full write up to chew on and critique, I can try to track it down. In our application here, anecdotal evidence will suffice as far as I’m concerned. – Month in which preparation began (for some July, for some November, etc.). The results of this study revealed that indeed, the null hypothesis that all athletes adapt the same is to be thrown out. There was however, a pattern to the way that athletes adapted to a system of exercises; three patterns to be exact. Across the 500 subjects in the study, three specific profiles of adaptation emerged. Nearly every athlete in the study could be categorized in one of these three groups. 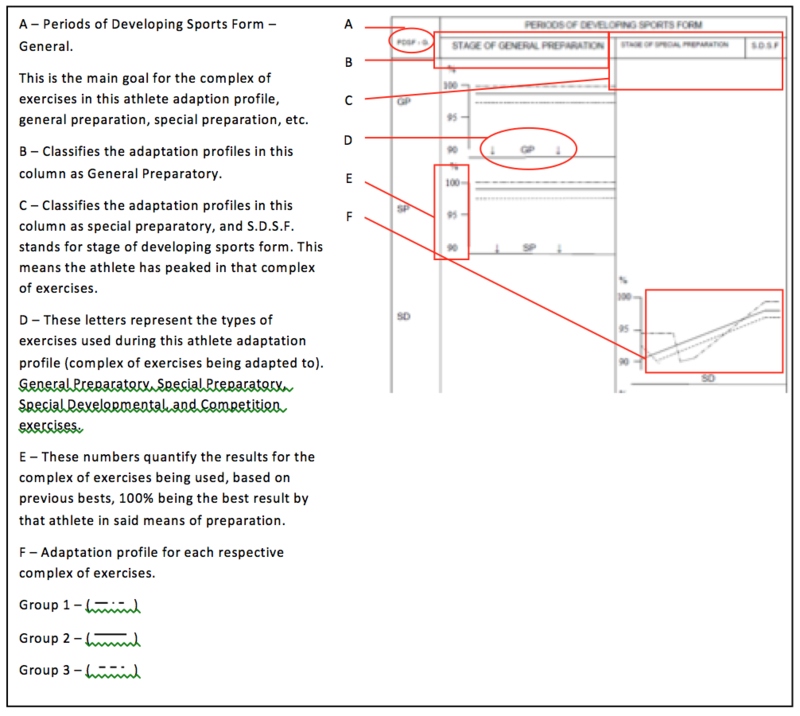 Thus, we see that the athlete adaptation profiles were born. What follows is a brief description of the three groups of adapters, or the three adaptation profiles. You will also find a chart, as found in Dr. Bondarchuk’s newest title Soviet Methods: A detailed look inside the World’s Greatest System. This chart is typical of the way in which Dr. B presents his training methods and the way in which athletes react (adapt) to them in his four adaptation books. These books have become known, somewhat notoriously, as difficult to read. For this purpose, explanation of how to digest them is provided. increase of 10% by the time the athlete reaches sports form. Group 3 – Initial Slow and continual increase of results by 8-10% by the time the athlete reaches sports form. The reader will find many interesting, albeit difficult to understand, examples of these profiles being laid out in Dr. Bondarchuk’s Periodization of Training In Sports. Vol. 1-4. As you will recall from article two in this series on Transfer of Training, I mentioned that adaptation was determined from statistical and subjective observations on the part of the researchers, which consisted of Dr. Bondarchuk himself and other Doctors of Pedagogy who worked in sport. Upon extrapolating the data collected from these athletes and compiling observations made by researchers the three adaptation profiles emerged. Athletes in Groups 1 and 2 both reach sports form after the same number of training sessions, for the most part. Athletes in Group 3 require more sessions to reach sports form in any given system of exercises. Periodization schemes which frequently switch exercises (such as Dr. Bondarchuk’s variation method) are not to be used with athletes belonging to Group 3. Athletes in Groups 1 and 2 are usually fast adapters, and more variable programs will still allow them time to reach peak condition. Understand that there are individual factors which play a role in adaptation, such as personality, compliance, calendar of competition, gender, sports mastery, and others. This is the way in which Dr. Bondarchuk would adjust his periodization approach once he had established the profile of the athlete. My take-away from this discussion was somewhat pedestrian. I was surprised at how simply it is applied. Some athletes take longer to reach their potential in a set of exercises, so if you are constantly cutting that time short by switching it up, you’re not allowing them to grow maximally. Simply giving athletes who adapt slower more time will allow them to reach peak condition. This makes sense in the conduit of the Bondarchuk system as well. His periodization models revolve around the system of exercises being used, not waving volume and intensity. When one period of training ends, it’s marked by a complete replacement of exercises into the next cycle. No exercises are repeated. Thus, models such as the variation method for example, require more sessions than say, the complex method, due to the sheer number of exercises being higher. The more exercises in a block of training, the more sessions are required to adapt, meaning that Group 3 athletes will need extra time to reach peak condition as compared to Group 1 and 2 athletes. I hope that this essay has supplied you with a deeper understanding of the Bondarchuk system and his Transfer of Training philosophy. I mentioned several of his periodization schemes in this article and I think it may be confusing to some who are not familiar with this more obscure area of Dr. B’s coaching philosophy. For this reason, the fourth and final installment of this series will cover all things periodization in the Bondarchuk system. Bondarchuk, A. P. (2011) Periodization of Training in Sports, Vol. 1. Kyiv, Ukraine: New Training Concept. Bondarchuk, A. P. (2011) Periodization of Training in Sports, Vol. 2. Kyiv, Ukraine: New Training Concept. Bondarchuk, A. P. (2016). Soviet Methods: A look inside the World’s greatest system. Muskegon, MI: Ultimate Athlete Concepts. Bondarchuk, A. P. (2016, August 02). Adaptation Profiles [Telephone interview].